Gelsemium, Hepar sulph, Arsenicum --and don't forget the Aconite! No energy? 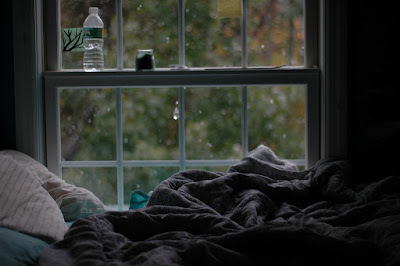 Feel like just laying in bed? Chilly? Headache? Tummy ache? Gelsemium: This is the main flu right now. Typically this flu comes on more in spring when weather changes from cold to warm. Person is tired and weak. The brain also feels foggy or too tired to think. There is a significant heaviness and chilliness which alternates with feeling of fever. Head feels heavy, eyelids feel heavy. The voice can be hoarse. The throat feels swollen or as if there is a lump in it. Pain and swollen feeling can extend to the ears especially on swallowing. This remedy is also useful for muscle weakness or fatigue that lasts long after the flu seems to be gone. 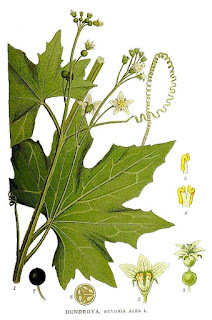 Hepar Sulph: This can be used concurrently with Gelsemium or by itself. Use Hepar sulph when there is a lot of mucous that is difficult to cough up. The stuck mucous can also fill the sinuses or continue to drain from the sinuses to the throat after the person feels that they have gotten better. Mucus is always thick in the case of Hepar Sulph. The cough will sound terrible even when the person doesn't feel bad anymore. Arsenicum: There have not been many people complaining of this but there have been some. This time the arsenicum flu symptoms are focused on the gastrointestinal tract. Arsenicum flus will exhibit some burning symptoms while the person feels very chilled overall. The person feels as if they just cannot get warm but the nose, throat and stomach (mucous membranes in general) can feel burning or acidic. This can lead to feeling nauseousness and vomiting. Warm drinks such as tea feel good to the throat and stomach. 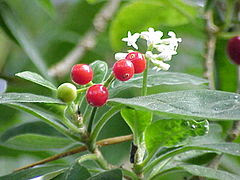 The nose can have thin, watery, acrid coryza rather than the thick mucous of Hepar sulph. ALSO: as we get into spring don't forget Aconite!!! When people are exposed to a cold wind and sickness comes on quickly (within 12 to 24 hours), give Aconite. This happens a lot in springtime because although it looks warm and sunny outside, the temperatures have actually not risen to summer levels. People often go outside without proper clothing or kids take jackets and sweaters off while playing then a cold wind comes and gives them a chill. Aconite Aconite Aconite first, then choose one of the remedies above. Get these remedies now and you will be set to ward of a flu when the first symptoms strike this spring. If you have already gotten over your flu but have residual symptoms that just won't seem to leave, Gelsemium, Hepar sulph and Arsenicum with set you to rights. --flu that comes on slowly. First you're tired, maybe the body/muscles feel a little heavy. Your brain feels a little slow or dull. But you don't yet realise you're getting sick. 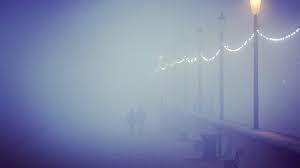 --symptoms are worse with cold, damp foggy weather. --heaviness in the limbs. All muscles feel relaxed, but not in a good way, more weak, heavy. The weakness and heaviness can lead even to paralysis, which is why it may be a good remedy for Guillan barre or other paralysis caused by vaccinations. --aching felt in the joints, but the main feeling is that of heaviness. The pain is a deep ache. --Despite the relaxation of the muscles there can be twitching around the eyes or face and also writer's cramp in the hands. --low back pain that feels deep, stiff, weak and goes to the hips. --head feels heavy as do eyelids. The eyelids might even droop halfway. It's too difficult to keep the eyes open. Everything takes too much effort, even keeping the eyes fully opened. --if there is a headache, it is in the occiput (back of the head) and behind the eyes. If not headache, the bones around the eyes feel bruised. Many areas of the body can feel bruised. --there is not much thirst and the inside of the nose might be dry. It is always good to have Gelsemium on hand. Because by the time you realise you have the Gelsemium flu, you are too tired, weak, achy and dizzy to go to the health food store. If you don't have any on hand, rest is the only thing that works for this flu. Gelsemium flus typically don't last too long once they are in the acute/feverish stage. But it's effects linger, with the achiness and slight heaviness lasting longer after the acute phase is over. So get some Gelsemium now so you can get better faster. A 30c dose is best. If you take Aconite within the first day of being sick, the homeopathic remedy has a good chance of turning things around. If you let the sickness develop too long before taking Aconite, you may need Hepar sulph. 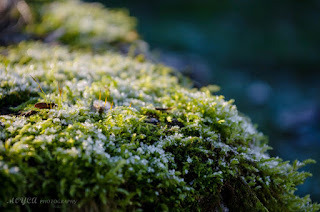 HEPAR SULPH follows many remedies and Aconite is one of them. When you have thick, stuck mucous or exudate (white spots) on the tonsils, Hepar sulph is a good choice. The sore throat will come and go with Hepar sulph and the sore throat pain will shoot to the ear when you swallow. Sometimes it feels like there is a splinter in your throat when you swallow. I haven't talked about Lycopodium in a couple of years. What I've seen are a couple of very typical Lycopodium symptoms: lots of abdominal gas and bloating and increased appetite. I've seen people with just the abdominal symptoms of Lycopodium, just the respiratory symptoms and just strep throat after having had a cough. If there are any gastrointestinal symptoms, I would try the Lycopodium first. 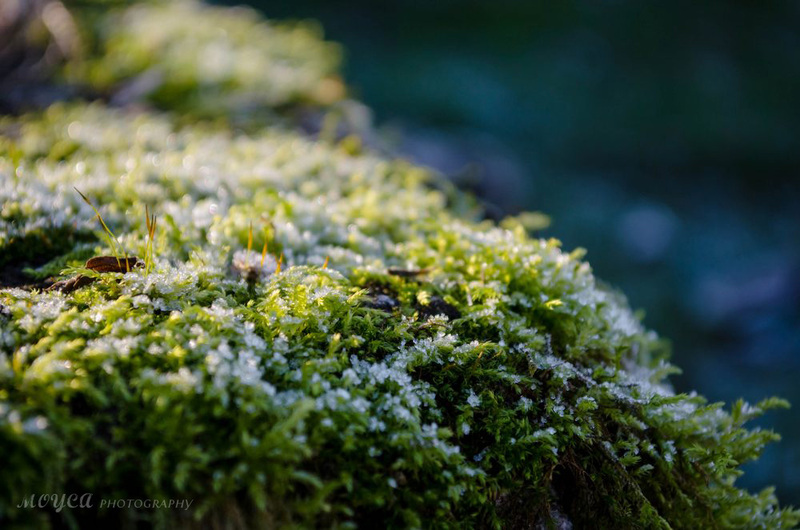 If everything starts right after being out in the cold and the symptoms come on quickly, try the Aconite. Use Hepar sulph when things go on too long (over a week or two) and the mucous seems really stuck. Taking a detour from talking about the flu, I'll write today about a very common thing happening now with already two patients coming to see me for this: spider bites! Now, you will read all kinds of information from spider loving people that spiders do not bite. however, when you see two little bite marks right next to each other, it's hard not to believe it's from a spider. Still, whether the bite is from a flea, spider or mosquito, the homeopathic treatment will be the same. There is a clear central pore which looks like an injection site. You will not see this in eczema or in contact dermatitis. 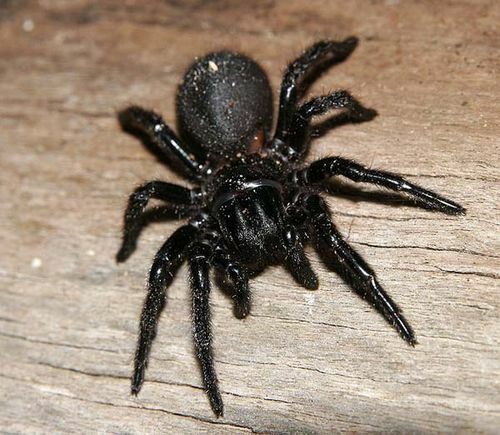 Many spider lovers will try to convince you it's one of these. Of course, it could be a flea or mosquito bite. But there are not mosquitos in the northwest right now. I've seen spiders at my house and the two patients do have cats. Ledum: number one remedy for insect bites. The area is cool but cold or ice applications feel good. The area may be red, bruised, and feel boggy. Apis: Similar in look to Ledum and feels better with cold applications. However Apis type infections are bigger with more swelling and looks a bit more like hives. Usually there is an allergic component to the reaction. Lachesis: the area can feel like it is burning or have an icy coldness to it and there is marked swelling as with Apis. It feels like the bite will burst. Sensitive to heat, touch or pressure. Sulfur: also markedly swollen and warm and worse with heat. Itchy. Hepar sulph: boils that turn into cellulitis which is very painful. Very sensitive to touch. Usually later stage when a different remedy was indicated at first but then the infection became worse. If the lesion is not a bite but is a MRSA infection, a bleach/water application or bleach bath (1/2 cup of bleach added to a full tub of water) will usually do the trick. 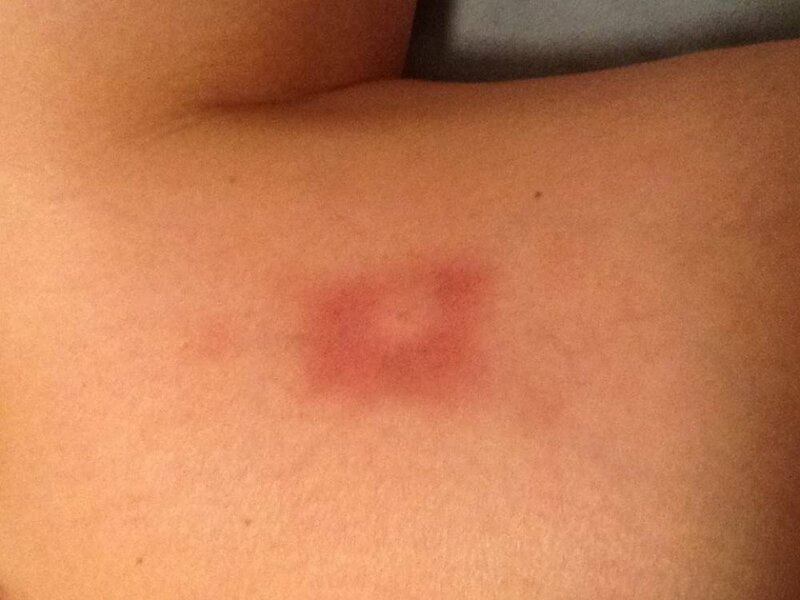 However see a doctor if you suspect MRSA or if you were bitten by a brown recluse spider. Just take the above homeopathics in addition to seeing the doctor. I think I've finally figured it out! The homeopathic remedy for this years flu. It has been tough. People have had sinus inflammation, severe headache, cough, even pneumonia. Pretty much every symptom in the respiratory tract. 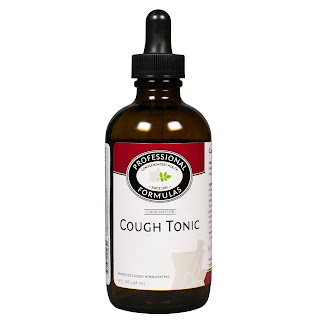 Antibiotic herbs or even antibiotics have not helped the sinuses or cough. It's definitely been viral. Even the pneumonia has been viral only. I have resorted to using lomatium--the most potent anti-viral herbal tincture we have--for treating this flu (and it has worked). But the homeopathic for this flu eluded me. 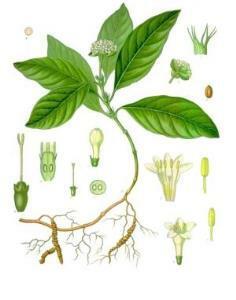 We tried Belladonna because of the intense headache and quick sinus inflammation. I tried Gelsemium because although some of the symptoms (especially in the nose) come on suddenly, most of the other symptoms develop over a series of days, starting with having a chill. We have been using Droseraplex (a combination of homeopathics including Drosera, Belladonna and others) for the cough and headache together, but it has only helped reduce symptoms during the virus (especially the cough) rather than stimulate a very speedy recovery. Speedy recovery is what we want when using homeopathics. I had this flu and it was bad. Then I felt like I was getting it again. Took lomatium. Then a few weeks later felt like I was getting it again. 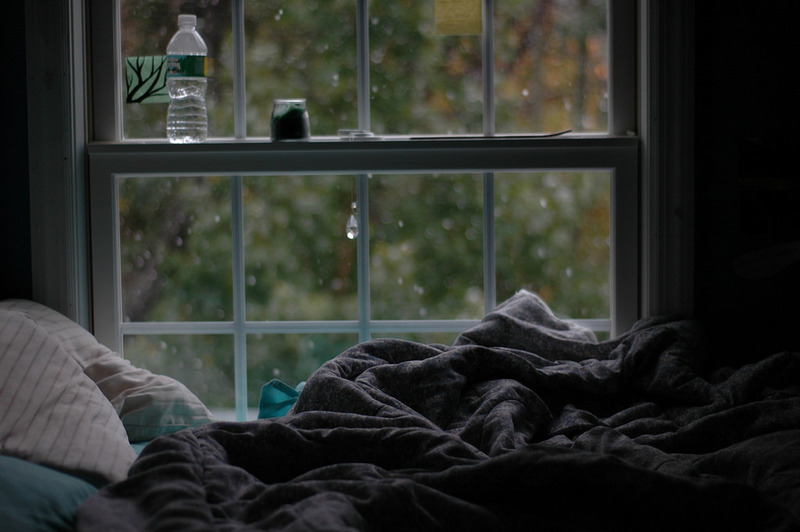 It started with feeling chilled--like not being able to let any cold air touch my body. I don't like having to have a space heater next to me all the time. It makes me feel like a wimp. I especially felt cold after getting hot and sweaty, such as when I left the gym the previous 2 mornings after a workout. Then I got pain in the sinus which leads to a frontal headache. I did NOT want to get this flu again. I also realized that my nose had been VERY dry and I had woken up in the night with a dry throat. Heating houses in winter dries the air. Dry mucous membranes do not defend the body against invaders as they should. I got out the humidifier. Then I realised the remedy: BRYONIA. Nose: dry, painful. Cold air moving into the nose and sinuses hurts. Nose and sinus can also feel burning and inflamed. Head: severe headache. This seems to be the hallmark of this flu. The headache, which at first is in the frontal sinus and then extends to the rest of the head, brings you to tears. Body: chilled. Worse with cold drafts, person wants to be wrapped up and laying in bed. Chill can be felt as achy pains or sharp pains and most of the pain is in the muscles. The chill and ache was so bad at first that I considered Eupatorium. It had even pushed me into buying a hot tub last month (which I had been looking at doing for awhile) and spending more than twice as much as I thought I would to do it! Bryonia can also treat swollen inflammations with sharp pains, such as those that come from gout, but I haven't seen this during this flu. Respiratory: cough. Dry cough which is painful, breathing deep produces cough so the patient tries to only breath lightly. Holding the chest may diminish the pain. Pleurisy, pneumonia, bronchitis. Gastrointestinal: constipation from dryness in the intestines. Stools can be hard, dark or black tinged, and there can be rumbling and abdominal pain. There has not been much vomiting with this one. 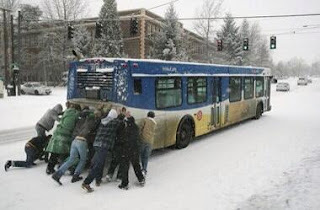 Here's a pic from Portland to help you remember a little about Bryonia and see how well we fare in snow. The below freezing temps dries out the air. Then imagine pushing a bus, getting hot and sweaty, then standing out in the cold and getting a chill. Perfect environment for a Bryonia flu! I just ordered this supplement to better treat this flu. It has the typical cough homeopathics: Drosera, Spongia, and the flu inflammation/pain remedy Belladonna, but also has Bryonia, which the Droseraplex did not have. It will be in tomorrow and we will start using it. Then I'll post and update. For now, I am taking Bryonia 30x and immediately after the first dose, my nose was became more moist and the sinus pain diminished greatly. You can usually find Bryonia at your local health food shop but this combination remedy pictured here is only available at doctor's offices. Most of us grew up in a house with a bottle of Ipecac syrup in the medicine cabinet. It was there for accidental poisonings--like when the baby gets into the cleaning solutions or an open medicine bottle. It's actually rarely recommended these days, but the use of homeopathic Ipecac has many uses and in fact we just used it yesterday. Carapichea ipecacuanha grows in South America and has long been known for it's emetic properties. Emetic means "induces vomiting" but it also can cause coughing to the point of expelling mucous, such as in the case of bronchitis. Basically it has an upward force, whether stomach contents or stuff in the airways it causes it to move up and out. Homeopathic dilutions of Ipecac have the opposing effect. As we know with homeopathy that like cures like, homeopathic Ipecac relieves vomiting and coughing. When is it best to relieve vomiting and coughing? When the vomiting or coughing is not producing a good effect. Certainly if someone did ingest something not good for them, vomiting is the body's way of getting rid of it. But in the case of a stomach flu, the virus will not be gone from the body after vomiting, it is only creating unpleasant symptoms. Similarly, if someone has motion sickness, vomiting will not alleviate vertigo. In the case of bronchitis, if a person does have a wet cough, certainly we want to expel the mucous. But in a dry viral cough or even asthmatic cough, the coughing is not producing any good effect. Pertussis (whooping cough) is a dry persistent cough where the child will cough and cough until they vomit. This is the perfect time for using homeopathic Ipecac. In Vancouver, WA there are two types of illnesses beginning to go around the schools. One is a 24 hour stomach flu and the other is a cough. Both can be perfectly treated with Ipecac. Two nights ago my daughter woke with a stomach ache and nausea in the middle of the night. She spent the next morning vomiting, not even able to keep down water. Her fever was 100.9. I gave her a dose of Ipecac 30c homeopathic pellets (put under the tongue or in the mouth and let dissolve). She did not vomit again after that. She was able to eat a little food that afternoon and able to drink two glasses of water. Her fever stayed at 101 until the late evening. That is Ok. Fevers are there to fight off viruses. For the fever we only gave more water. This morning she woke fever free and feeling fine. Did the Ipecac change the length of the illness? Probably not. But it did help the symptoms while she was ill, ensuring that she did not get dehydrated and she could feel better on her day off from school. In the same way, Ipecac will likely help a case of pertussis or dry cough (though there are a couple of other remedies also great for this), but the person taking it may still be contagious even as their cough quiets down. A person with an asthmatic cough can be helped with homeopathic Ipecac, but they should probably also get their allergies eliminated (through NAET) to take care of the problem permanently. Ipecac is not recommended much anymore. But homeopathic Ipecac definitely is! If this is not in your medicine cabinet at home, go out and get some. It may save you when vomiting hits in the middle of the night. The stomach flu has hit the west coast. Much of it was being blamed on Chipotle, which accoring to lab tests had something to do with some of the symptoms going on. Then there is Norovirus going around. Basically, people are being hit with vomiting and other gastrointestinal symptoms really fast. Sometimes it comes on at night, other times people have to turn around and go back home while on their way to work. Either way, the symptoms get bad quick. The vomiting can start with dizziness, headache, abdominal cramping or coughing. Typically with a Veratrum album flu, there is abdominal distension as well as diarrhea. Vomiting is forceful, causing projectile vomiting and dry heaves. If it starts with a cough, head to the bathroom if there is any nausea present. Because this flu comes on so suddenly, one might think they have food poisoning. 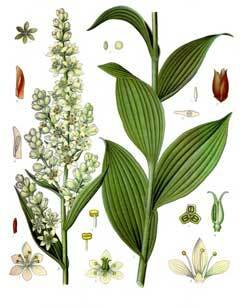 However, even in cases of food poisoning, Veratrum album is useful for calming the dry heaves and diarrhea and returning the gastrointestinal system to normal after the offending agent is out of the body. I have included Ipecac with this prescription because when a person is vomiting and dry heaving all night long, you don't want to wait a few hours to figure out if the prescription was exact. Ipecac is also for nausea and vomiting and vomiting with a cough. It is a perfect example of homeopathy. Full strength Ipecac (found in Ipecac syrup) is used to induce vomiting when a child has eaten poison. Homeopathic Ipecac brings the energy back down, relieving vomiting and coughing. Like cures like. Since this flu seems to come on suddenly and many times at night, I advise everyone to go down to the health food store and get Veratrum album 30c or 12c. 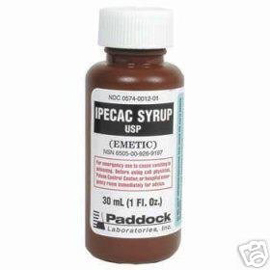 Ipecac is also useful to have on hand as it relieves the nausea of carsickness and even nausea of pregnancy. Generally speaking, in situations other than food poisoning, nausea and vomiting does not do us any good. It is just a symptom of a flu virus, inner ear problem or sequalae of riding on a boat or driving on a winding road. Keep these remedies on hand ...especially this winter! Sheryl Wagner. Awesome Inc. theme. Powered by Blogger.